'Priceless' Almost Ocean Front , 4BR/4BA, Upgrades, Pet friendly, & Discounts! ASK ABOUT a $100 discount for booking before Feb. 15th! Permission must be obtained before booking. One dog limit. WiFI Internet and Wii Console. Elavator, 1st floor ocean view and convenience! This is ALMOST OCEAN FRONT without the cost! Best prices on large beautiful villa, Ocean side just across from beach access! The 'PRICELESS' is a Family-friendly, spacious and professionally decorated 2nd Row, 1st floor villa with 4 large bedrooms and 4 baths! Perfect for couples, golfers and families vacationing together. Like New, CLEAN, and ALMOST OCEAN FRONT!! New deck furniture, 4 TVs, Wii console/Fitness game & board, and Bose Ipod stereo dock. This well-equipped, 4BR/4BA Villa is located just behind the OF homes with only a few steps across access road to beach( no walking across the main street from the sound side villas). Immediate beach access on this exclusive, uncrowded West End of Ocean Isle Beach, NC. Offers 1st floor, 2nd Row convenience and gorgeous ocean views and sounds with just a stroll to beach front Ocean Pool and Club/Restaurant. 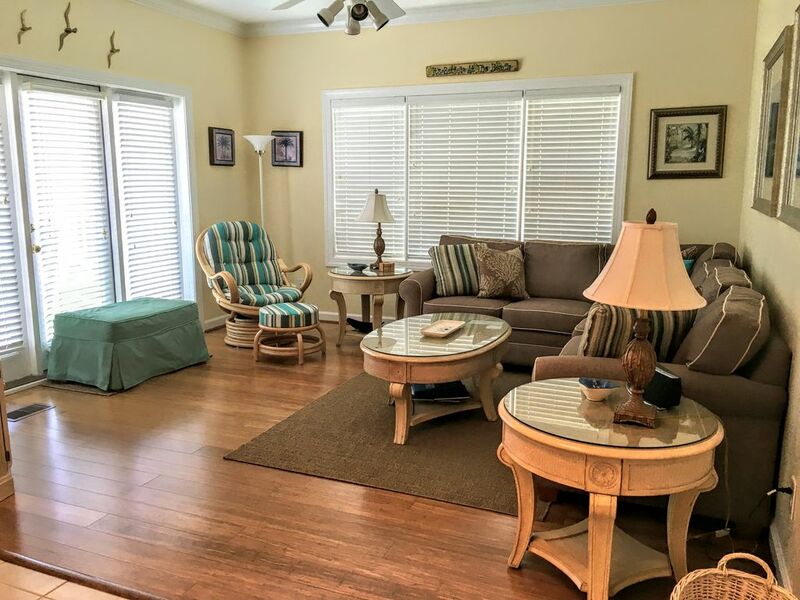 This is the perfect spot for young families who want quick beach access and an up-scaled, large, beautiful vacation rental with ALL the amenities! Just hop off the deck and in less than 100 steps, you are on the beach access! Rental price includes entry into the Islander Beach Club (1 block from villa ) with its large OCEAN FRONT POOL, hot tub and tanning deck, gated kiddy pool, lockers, Tiki Bar and exclusive DINING at the Isle's Restaurant. Also, don't forget your tennis rackets- 4 lighted tennis courts are just across the back street! ! Use of the Islander Beach Club is included FREE with your rental fee Mem day thru Labor Day. The villa is also equipped with an elevator from the parking level to all floors, outside shower, hose, charcoal grill, beach chairs (4-6), umbrellas, pack-n-play, high chair, stroller, beach toys, indoor games, game table, Wii console and games. All this pleasure is 'PRICELESS' but discounted if you rent directly from the owner! Ocean Isle Beach offers the perfect FAMILY GET-AWAY:: Beach, GOLF, Fishing, and water sports for any age. If you want more action, visit Myrtle Beach (JUST 30 MINUTES SOUTH) for exceptional shopping, restaurants, and other family attractions such as: Broadway on the Beach, Myrtle Beach Aquarium, Barefoot Landing, Alabama Theater, House of Blues and the Palace Theater! If GOLFING is your passion, visit one of the 36 championship courses within a ten mile radius of the Villa. Oyster Bay, The Pearl, Tigers Eye, Marsh Harbour and Angels Trace are within 10-20 minutes. Another 75 courses are located within a 30 mile radius. For water enthusiasts, enjoy the convenience of jet ski rentals, para-sailing trips and deep sea fishing excursions, as well as kayaking, crabbing, or fishing along the inter-coastal waterway. Hi! Thanks for checking us out and welcome to our villa!! We live and work in Shepherdstown, WV about 70 miles from D.C . OIB has become our favorite spot over the past 12 years as it has everything for the perfect vacation in spring, summer or fall. If you have family members who like to do more than sit on the beach- this is the place to be- golf, crabbing, boating, fishing, tennis, Myrtle attractions, theatres, etc. This is the perfect spot for sun, sand, group vacation and get-a-ways... and of course, golf- something for everyone! Great location for wedding parties...Pool, Restaurants, golf packages, winery, easy back and forth to beach, great ocean views and sounds, safe access road for biking, jogging, scooters and kids. We love Sugar Shack, 2nd St. bar (bands) the Friday night concerts, Calabash and lots of new shopping!!! *** LINENS not included, you may rent them locally or bring! 1st Floor convenience--Deck with NEW outdoor dining furniture, rockers and great ocean views and sounds!! Portable game table with chairs, Security gate for dog. Outside storage with beach chairs, grill & beach toys. Wonderful Villa. Beautifully decorated, everything you need, great views..
Hope you can return and appreciate your positive review. This beach condo is awesome. It is super close to the beach access and has everything you would need for the beach including chairs and umbrellas!!! The condo was very clean and we enjoyed ourselves greatly! We will definitely be back!!!! Thanks RC! I am so glad you found us and look forward to your return! thanks again ! Priceless holiday! We had everything we needed in the comfort of a beautiful home. Thank you Palanks. So glad! Thanks for staying, and hope you will remember us for future. Convenience to the beach is the best! Very comfortable couch in the family room! It’s great to be a 2 minute walk to the beach. From early morning to late evening walks, being able to go jump in the ocean in between the rain showers was just what the doctor ordered!! Glad you enjoyed your week! Hope you will consider us next year. Our stay here was wonderful. The villa itself was nicely decorated and very clean. The porch was really nice as it had rocking chairs and a very nice table that seated 6 people so we could have meals outside which was great! The beach access is really close which was great. Kitchen is well stocked with anything you may need. Owners were easy to contact, quick to respond and provided great information about the villa as well as things to do in the area, places to eat, etc. Would definitely stay here again! Glad you enjoyed our villa and hope you will consider us in the future! This is our 3rd year at priceless. I just love Chris, she is always so quick to respond to my questions. We love this condo. It has everything our family of 10 needs. Convenient to the beach, shopping, and restaurants. Can’t wait to go back in 2019. Glad you found us and so glad you will be returning in 2019. Please send inquiry for any questions regarding rental and booking options.